The Indian women’s hockey team for the continent’s biggest sports festival Asian Games has Lalremsiami as the youngest player in their squad. Lalremsiami belongs to Kolasib, a town just 85 km north of Mizoram’s capital Aizawl. 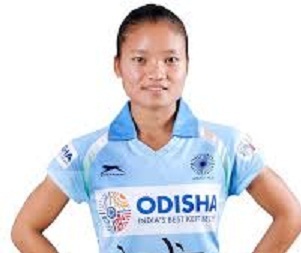 A report published in the The Indian Express stated that Siami, as she is fondly called by her teammates, is believed to be the brightest prospect of Indian hockey and was awarded ‘the Under 21 rising star award’ at the 2018 Asian Champions Trophy, where she played a total of 31 minutes on the field across five matches scoring two goals and helped India win the silver medal. The approach road to Kolasib, the hometown of Siami, has no proper street lights, and is dotted with potholes and muds. Siami’s small house has its wall covered with medals, citations and trophies. When Lalremsiami represented her school at Kolasib school sports at the age of 10, she was adjudged as the best hockey player of the games with a cash award of Rs 500. “That was her first earning from hockey,” recalls Thansanga. Since then, the journey of a timid and soft-spoken Mizoram girl, Siami, was an exciting and incredible one. At age 11, she was selected as a trainee for the State Government run hockey academy in Thenzawl, Mizoram. “When she told me she was selected for the academy the first thing I asked her was, ‘Is that for free?’ because I know we couldn’t manage to do it if they asked for a monthly fee,” says Lazarmawii, mother of Lalremsiami. “When she was about to leave for the State Academy, she told me she will represent India one day. But I just laughed off,” says Siami’s mother. “I know she is quite good in the game from her coach, but playing for India? That dream was way too big for a mother, who doesn’t know anything other than farming,” she admits she couldn’t join her daughter’s dreams at the initial stage. Eight years later, her first senior call-up came and helped India win gold at the 2017 Asia Cup and went on to represent India at the 2018 World Cup where she was the youngest Indian player at the age of 18. From the town’s school games to the State Hockey Academy, a transfer to National Hockey Academy and now a regular member of the senior national team – Lalremsiami’s trajectory is the stuff of dreams. Struggling to make ends meet at times even joining the National Hockey Academy, New Delhi in 2016 needs a big dedication of Siami’s parents, who couldn’t even visit her during her time in Thenzawl, only because of the taxi fare to the Academy cost around Rs 300. “She once called me to say that she only had two rupees left in her pocket. I feel like I failed her, not doing enough for my daughter and that hurt me the most,” says an emotional Siami’s father – but he refused to give up. “I called her roommate whom she used to call Didi (current India captain Rani Rampal), and requested her to lend her money,” he smiles. “They are good people, they give her what she needs and I’ll arrange it later on,” he continues. Despite lack of funds, Siami’s parents continued to encourage their daughter, while she too did not have it easy with the national team. “When I first arrived in Delhi, I couldn’t even speak a single word of Hindi,” says Siami. “My first biggest fight was the language barrier. I continued to learn through my Mizo-Hindi dictionary, while Didi (Rani Rampal) also helped me a lot. My Hindi is a little bit okay now,” she says. While her ‘Hindi’ might still sound broken, Siami continues to entertain the Indian hockey fans with her path-breaking performances and today, she dreams of an Asian Games ‘gold’ around her neck.With her incredible skills and supreme control over the ball known to all and sundry, a talented forward who had this exceptional ability in one-on-one situations with a beautiful control over the ball, Lalremsiami surely is, not only the next big thing in Indian hockey but also in all sports.